These playful lilac glass earrings by kate spade new york accessories are peppered with pops of classy cubic zirconia. 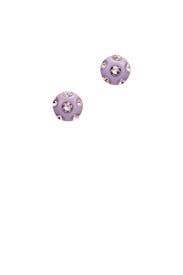 Lilac resin stud earrings with CZ glass stones. Post backs for pierced ears. 1" long.